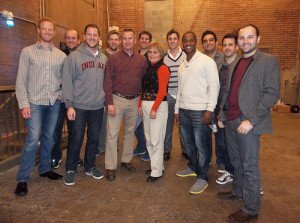 Acclaimed a cappella group Straight No Chaser performs in Loveland on October 24 at the Budweiser Events Center. The one-night-only show starts at 7:30 p.m. and promises to thrill music enthusiasts with songs from the group’s most recent album, Under the Influence. A cappella is not currently in popular radio’s regular rotation, but if Straight No Chaser is any indication of the genre’s resonance with fans, maybe it should be. The group has been recognized as one of the highest profile groups of its kind in the world, even collaborating with such headline-grabbing stars as Phil Collins, Stevie Wonder, Elton John, Dolly Parton, Rob Thomas, Seal, and Jason Mraz. The songs performed live at the Budweiser Events Center will sound familiar to listeners, but with the inimitable style of human voices replacing musical instruments. Ticket prices start at thirty-five dollars and range up to sixty-five dollars, plus added fees. Tickets are available online at www.ComcastTIX.com, by phone at 877-544-TIXX (8499), and in person at the Budweiser Events Center Box Office. The ten-member group continues to add to its fan base and reputation during this world tour. Don’t miss the performance that will have you singing the praises of America’s favorite a cappella group!